You are turning the magical age of 65 and there is so much to consider! Should you be enrolling into Medicare? What is Medicare exactly and what should you be doing with the tons and tons of mailers you’ve been receiving? If your desk is covered with Medicare brochures and you have no idea where to start, then this post is for you! Medicare can feel a little scary when it’s entirely new to us. Most of us have been on the same health plan for decades or have had insurance through our employers. And now we hit 65 and have all these plan options but have no idea which plan will be right for us. Maybe you are new to Medicare, and it will be your primary insurance. Perhaps you are still working and not even sure if you need Medicare, but you want to make sure you don’t get hit with a late enrollment penalty. If you are feeling confused, please know that you are not alone! This post will help you understand how Medicare works and the plan options that will be available to you! We see many people try to jump into figuring out which insurance carrier or which drug plan will be best for them. They try to decide between a Medigap plan or a Medicare Advantage before understanding the basics of Medicare. So, let’s put all that information aside and let’s get familiar with the basics of Medicare. Your Original Medicare consists of Part A and Part B. These are provided to you by the federal government. You are typically automatically enrolled into Medicare Part A upon turning 65. Most people will have to enroll into Medicare Part B through the Social Security office. Anything in your mailbox that comes from the Social Security office or the Centers for Medicare & Medicaid Services is mail you want to keep. Part A is your Hospital Coverage. This coverage pays for your room and board in the hospital or in a skilled nursing facility. Part B is your Outpatient Coverage. This includes pretty much everything else: doctor visits, surgeries, lab-work, durable medical equipment, diagnostic tests, etc. You are eligible for these 3 parts of Medicare on the first day of the month in which you turn 65 (or earlier if you have qualified for Medicare due to disability). Understanding Medicare just got a little easier! Now that you know these 3 basic parts, keep them in mind as we continue. So now that you understand the 3 parts of Medicare, you will need to know what you will be expected to pay. This will be especially helpful if you are still working and are deciding whether to stay with your employer coverage or obtaining Medicare as your primary insurance. Medicare Part A is free for most people, as long as you or a spouse have worked at least 10 years in the United States. Medicare Part B depends on your income. 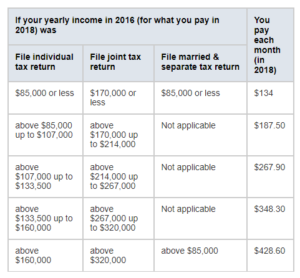 Most people new to Medicare in 2017 and 2018 will pay the standard amount of $134 month. However, if your modified adjusted gross income is above a certain amount, you may pay an Income Related Monthly Adjustment Amount (IRMAA). Medicare uses the modified adjusted gross income reported on your IRS tax return from 2 years ago (the most recent tax return information provided to Social Security by the IRS). If your income has decreased since 2 years ago, you can file a reconsideration request with Social Security. You’ll present proof of your lower income and ask Social Security to lower your Part B premium. They will reconsider your premium and notify you if it can be lowered. If you are receiving Social Security Benefits, your Part B premiums will be automatically deducted from your benefits. If you’ve delayed your Social Security Benefits then you will receive a quarterly invoice in the mail. You may also elect to be set up on automatic deductions from a checking or savings account. Enrolling into Medicare Part B is necessary upon turning 65 however, if you are still working and have coverage through an employer, you may delay enrolling into Part B. Some of our clients who have coverage through an employer decide to enroll into Medicare Part B and obtain their own Supplement insurance because benefits might be richer than what they are offered through work or premiums may be more affordable. Please contact us directly if you are still working and have coverage through an employer to determine if you should enroll into Medicare Part B and obtain your own coverage. Most states have more than 20 different drug plans to choose from. These drug plans are offered by different insurance carriers and premiums vary. The average cost of a drug plan is about $35 a month. If you owe an income adjustment for having a high income, you will pay an additional surcharge that is added to your monthly premium for Part D.
Part D plans have different drug formularies, so you’ll need to be sure that you choose one that covers all your medications at affordable prices. Straight Medicare alone is not a full coverage health plan and was not intended to be. Medicare covers most of your health care costs, but you are still responsible for your share. This includes things like deductibles, coinsurance and copay’s. Medicare Part A pays for your first 60 days in the hospital. However, you will be responsible for your hospital deductible which will be 1,340 for 2018. After 60 days consecutive days in the hospital, Medicare pays a diminishing share of your benefits. You begin paying a larger share in the form of a daily hospital copay. This can be hundreds of dollars per day, so you need supplemental coverage to protect you from those expenses on Part A services. Part B pays 80% for outpatient care. This includes things like doctor visits, surgeries, durable medical equipment, chemotherapy, lab work etc. After you pay your Part B deductible ($183 for 2018), you will be responsible for the 20% that Medicare Part B does NOT cover. Your share of the 20% of all of these services has no limit. That can be quite a bit of money for major procedures such as surgeries or cancer treatments. You’ll need supplemental coverage to protect you from high Part B expenses. Now that we’ve outlined the parts of Medicare and the costs, we will now discuss your supplemental options. Medigap Plans (also called Medicare supplements) are offered by most major insurance carriers. Medicare will remain your primary which means that you may go to any doctor or hospital in the nation that accepts Medicare! Medicare will pay your medical claims FIRST and your Medigap plan will pay second. There are different Medigap plans however they will all pay the 20% not covered by Medicare. These plans cost more than Advantage plans because they are more comprehensive. They also give you more freedom in choosing your providers. Medicare, nor the Medigap plans cover Part D (prescription coverage). You will need to enroll into a drug plan should you want drug coverage. Medicare Advantage Plans (also called Part C) are also offered by most insurance carriers. These plans will become your primary insurance and will pay INSTEAD OF MEDICARE. However, you will still need to stay enrolled into Medicare Part A and Part B. These plans are optional and were created to give a low-cost alternative to Medigap. Advantage plans are private insurance plans with their own local network of providers, generally, an HMO. When you join an Advantage plan, you’ll see these providers in order to get the lowest copay’s and you may be required to obtain referrals to see specialists (if you are in an HMO). You will have set co-pays for doctor visits, hospitalization etc. Most Advantage plans include Part D prescription coverage. When deciding between a Medigap plan or a Medicare Advantage Plan, ask if being restricted to a specific network of doctors would work or if you would like to have freedom of choice to choose your own physicians and hospitals? Would a local network plan work for me or do I need wider access because I travel? Which plan would give me the most peace of mind? Am I okay with paying co-pays as I go along in order to get lower premiums up front? These are the kinds of questions that will lead you to the right coverage! Our agency has been helping people new to Medicare for many years. We’ve already learned what’s important and what isn’t. Our service is free. We’ll guide you through the next steps to enroll in the right parts of Medicare. We’ll also help you find the most suitable supplemental coverage and a cost-effective drug plan. We can help you avoid any unnecessary coverage!